^ 1.0 1.1 1.2 Profile: Rachel Corrie. BBC News. 2012年8月28日 [2012年9月13日] （英语）. ^ Harriet Sherwood. Rachel Corrie's death was an accident, Israeli judge rules. 《衛報》. 2012年8月28日 [2012年9月8日] （英语）. ^ 3.0 3.1 3.2 Court dismisses damages claim in Rachel Corrie case. The Times of Israel. 2012年8月28日 [2012年9月16日] （英语）. 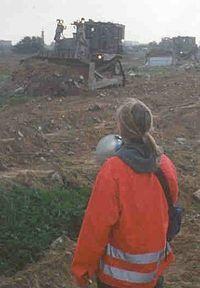 ^ Rachel Corrie: a memory that refuses to die. 《衛報》. 2012年8月28日 [2012年9月7日] （英语）. ^ Gordon, Neve. No justice for Rachel Corrie. Al Jazeera. 2012年9月5日 [2012年9月13日] （英语）. ^ Israeli bulldozer kills American protester. CNN. 2003年3月25日 [2012年9月8日] （英语）. ^ Mackey, Robert. Witness-to-Rachel-Corrie’s-death-responds-to Israeli-court-ruling-absolving-soldier. The New York Times. 2012年8月28日 [2012年9月14日] （英语）. ^ Urquhart, Conal. Israeli report clears troops over US death. The Guardian. 2003年4月14日 [2010年4月12日]. ^ Webley, Kayla. Who Is Rachel Corrie?. Time. 2010年6月4日 [2010年6月6日]. ^ Rachel Corrie: A worldwide symbol of the Palestinian struggle. arabnews.com. 2011年3月16日 [2012年9月8日]. ^ Noga Tarnopolsky. Rachel Corrie's death: 'it's a no brainer that this was gross negligence'. Alaska Dispatch. 2012年9月1日 [2012年9月8日]. ^ Ruth Pollard. Israeli army cleared of activist's death. The Sydney Morning Herald. 2012年8月28日 [2012年9月7日]. ^ Life of crushed US activist Rachel Corrie not worth $1: Israeli court. The National. 2012年8月29日 [2012年9月7日]. ^ Hass, Amira. U.S.: Israeli probe into Rachel Corrie's death wasn’t ‘credible’. Haaretz. 2012年8月23日 [2012年9月5日]. 7 Years After, Family of Rachel Corrie Heads to Israel for Wrongful Death Suit – video by Democracy Now!